For this year’s Culinary Issue of Passport magazine, our writers and photographers traveled the world and discovered some of the most wonderful people and places on the planet that feature and celebrate the art of eating, drinking, and enjoying life to the fullest. Come with us as we explore the “Undiscovered Wine Regions of North America.” From Ontario to Missouri to California these lesser-known wine destinations produce great vintages, boast wonderful scenery, and are filled with exciting activities to keep you busy between tastings. For those of you who get the “munchies” on a regular basis, our feature on “Cannabis Tourism” is sure to be an inspiration. There’s a new kind of tourism budding across America, and it’s growing bigger every day. Cannabis is the future, they say, and retailers, farmers, manufacturers, marketers, and a wide array of entrepreneurs are all part of this emerging trend. If you’re heading to Europe this summer, join us for “A Taste of Austria” as we travel to Vienna, Graz, and Salzburg and enjoy a one-of-a-kind edible excursion. 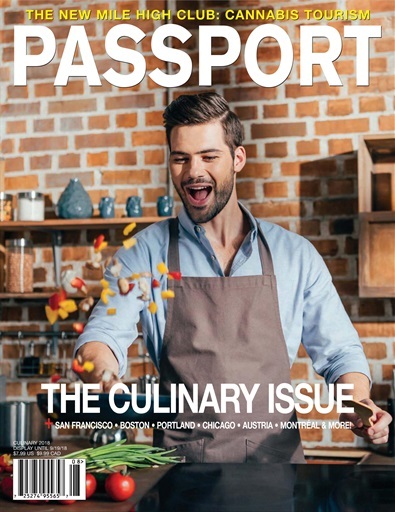 Also in this issue, get up close and personal with six incredible Portland, Oregon tastemakers from outstanding pastry gurus and vegan chefs to a distiller who makes spirits from kombucha; head to Sonoma County and discover the sweet treats and unique products that are the perfect gifts to bring home to family and friends; delight your palate with the gastronomic temptation awaiting you in San Francisco; find out what’s new in the alway exciting, creative city of Boston; and let our insider guide, Elijah Bradshaw from W New Orleans – French Quarter take you on a tour of all things culinary in the Crescent City.